EPC Group offers SharePoint assessment and consulting services including health check assessment and hybrid architecture assessments for organizations of every size and deployments to meet any business or technical requirement. As the Information Age reaches a new level of maturity, many organization are finding that the data and content they have been storing, both physically and electronically, have become both an immense administrative burden as well as a security risk and key to unlocking potential for the organization. With consumer electronics and network bandwidth, storage and accessibility becoming tantamount to an organization’s well- being, it also becomes increasingly important for every organization to not only manage their information stores appropriately, but to also provide the foundation and tools necessary for their information workers to both perform their duties and to do them well. SharePoint as a centralized, enterprise-level web-based collaboration platform has changed the way many businesses work and manage information and with every iteration there are platform improvements as well as more tools and integration with fast-growing technologies and practices. Thus it becomes important for a business to both assess their current situation as well as plan and implement solutions to meet these needs, especially if SharePoint is at the core of those needs and also ensuring it is scalable for any future hybrid cloud requirements, should they arise. Microsoft has done a tremendous job in making SharePoint, Exchange, Skype For Business,Yammer and Office 365 tools for the modern Information Age for every organization and of any size. This enables organizations to get a hold of their information reservoirs and the most out of them. However, that does not make putting SharePoint and other integrated solutions in place any easier. Along with tremendous improvements to the platform and the related technologies, new practices of devices and mobility, virtualization, DevOps, hybrid cloud and others make shaping and tuning an appropriate SharePoint and related-technology solution challenging at best. 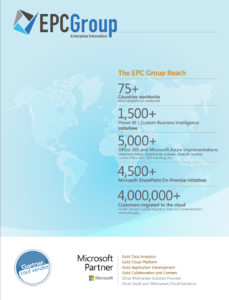 EPC Group provides full lifecycle services that involve planning, designing, customizing, deploying and supporting SharePoint and related technologies in this latest world of work to both meet the organization’s growing need for managing their information as well as getting the most out of this mission-critical asset. From infrastructure to customization to training, EPC Group’s focus and goal is for every organization to benefit from what they already have with the right tools and solutions properly fitted and adopted for their unique needs. EPC Group views SharePoint not simply as a platform, but as the centerpiece of a much larger suite of technologies that will allow for an organization to control and benefit from their information pools, understanding that SharePoint is more like a service of sorts (SharePoint as a Service) that also integrates with other valuable services such as unified communication and social computing. SharePoint-as-a-Service (SPaaS) reinforces what the platform was originally meant to do – act as the foundation for integrating the organizational technologies and information stores into seamless, transparent systems as solutions. Integrating SharePoint with various other services such as email, instant messaging, social computing, business intelligence, data visualization and other areas leverages fundamental business technologies to further enhance how an organization gets work done. Logical Access Points – How does the client access the content? Effective Naming – What does the client need to know to access content? Database Location – Where is the data located for security and compliance purposes? Expected Availability – What level of guarantee to data availability will there be? Integration Points – What types of integration needs, such as tasks or email, are necessary or useful? Communication – How will clients communicate with other clients? Content Access – How will the client access their data and from where? Content Security – How secure will the content be once accessible by clients? Content Updates – How will clients be informed about content changes and how it may impact them? Content Sharing – How will clients make important information available to other clients? Content Discoverability – How easy is it for a client to look for the content applicable to their work? Content Relevance – How will the client know if content is appropriate or related to their work? Data Insights – Can the client get a deeper understanding of the data they already have? Data Accessibility – Will the client be able to access content in different locations or formats? Web Design – How quickly can changes be implemented with minimal disruption for clients? Self Service – Will clients have access to applications or solutions based on their specific needs? Adaptive Experience – How relevant or targeted will the client experience be? Administrative Effectiveness – How agile and transparent will managing the environment be for the client? Optimized Environment – How quickly and effectively can the environment be optimized to benefit the client experience? Risk Management – What is the level of expectation for preserving or restoring important content for the client? Flexible Services – How will existing services be enhanced or complemented for the client needs? Compliance Policy – Can compliance and policy support be met and to what impact to the client? Update Effectiveness – How transparently will the environment be updated to meet client needs? Helping organizations to ask, discover and answer these and other important questions, as well as plan, design, build, implement, customize and support these answers is all a part of what EPC Group does to help organizations achieve important business goals. As each organization is truly unique despite similar industry classifications, it is vital that leveraging SharePoint as a Service as well as a solution is not viewed as a canned and cookie cutter implementation with the occasional tweak here and there, but as a solution built to the organization.